“What you meditate upon, you shall become.” This principle is fundamental not only to the teachings of Sahaj Marg but to every area of human endeavour. When we think continuously of any one thing, we are meditating (Why meditate?). Whether our intent is to make a fortune, discover a cure for cancer or create a beautiful garden, the more we think about our objective, the more the thought expands and fills our lives. It is important, therefore, to choose as the object of meditation that which we wish to become. The goal of Sahaj Marg is God realization, sometimes referred to as Self-realization on the premise that the divine exists within the heart of each human being. Being infinite and without attributes, the object of our meditation has no name or form. Therefore we have been given the most subtle and pure thing to meditate upon, which is Divine Light in the heart. The method is to sit comfortably in one position with the thought that our heart is filled with Divine Light. We do not visualize the light but only suppose that it is present. As other thoughts arise, we gently divert the mind back to the heart and wait patiently for this divine presence to manifest. Non-attention is the best response to unwanted thoughts, as thoughts without our attention have no power. With practice, as we learn to regulate the mind, mental chatter gradually disappears and we become more receptive to the guiding influence of the heart. Mind and heart thus begin to work together in a balanced way. As our practice deepens, we learn to maintain this balanced state in the midst of life’s activities. Meditation is different from concentration. When we try to concentrate, the ‘I’ (the self) is there. But when we meditate, we wait for something higher. The effect of this waiting creates an attraction, and we begin to draw to ourselves the object of our focus. Sooner or later in meditation we slip into a thoughtless state known as absorption. It is a condition in which we temporarily ‘lose’ ourselves, and at the same time we expand into the greater Self, beyond time and space, beyond our individual identity. This experience rejuvenates us on every level. "It is a human weakness to imagine that we must prepare ourselves for meditation. Meditation itself is a process which prepares us to receive the grace of the Almighty through the preparation of the mind, conditioning of the mind, regulation of the mind, because the mind is the most potent thing that we have." 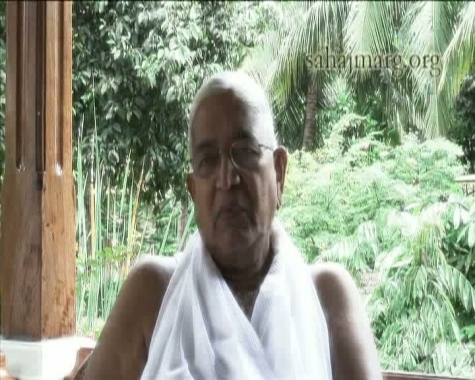 Audio Media : Listen to a talk on "Practice of Sahaj Marg"